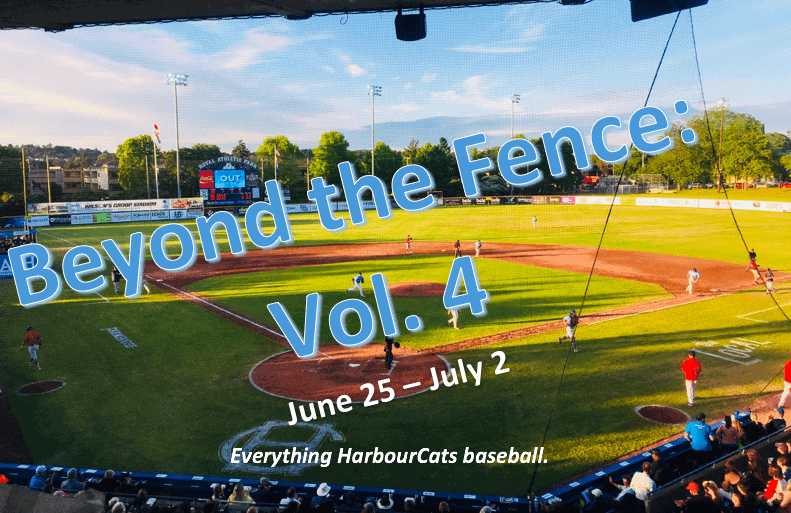 Go beyond the fence with everything HarbourCats baseball in this column from Summer Intern Josh Kozelj. Happy Monday HarbourCats fans! It’s that time again for the fourth installement of Beyond the Fence! It was great seeing so many of you at the ballpark over the Canada Day Weekend Series against Kelowna, and I hope you enjoyed watching players and GM Bran Norris-Jones in the dunk tank as much as I did. Here’s everything you need to know about the latest week in HarbourCats baseball. NOTE: All stats for player and pitcher’s of the week are collected from games played during June 25 – July 2 against the Walla Walla Sweets and Kelowna Falcons. Position Player of the Week: OF Dustin Miller (Chico State) – Miller’s phenomenal week at the plate was highlighted by a four hit, two home run, and 8 RBI night in the HarbourCats 18-7 win over Kelowna on June 30. That outburst brought the outfielders batting average up over 60 points from .179 to .244. Pitcher of the Week: RHP Tyler Yoshihara (Pomona-Pitzer) – In his second pitcher of the week nod, Yoshihara fired six innings of no-hit and no run baseball, and collected his third win of the season June 25 in Walla Walla. The righty out of Pomona-Pitzer has been a force on the mound all season, not allowing an earning run and boasting a sparkling 0.00 ERA in 15 1/3 innings with 18 strikeouts. After dropping two of three to the North division leading Bellingham Bells, the HarbourCats travelled south of the border for a visit to Walla Walla, Washington for a date with the Sweets who were in the midst of battling for a South division title themselves. The HarbourCats clawed back from a 6-3 deficit in the final innings to take a 7-6 extra innings victory in the series opener. Trailing by one entering the night, Jason Willow collected his third hit of the night with a triple to the gap, and later scored off a Jack Smith sac-fly to send the game to extras. From there Smith racked up his second sac-fly in the 11th to give the visitors the win, Yoshihara came in for relief and produced four no-hit innings on the mound as well in the victory. In game two the HarbourCats jumped out to an early lead in the first, courtesy of a Mike Malinchak RBI sac-fly, but Victoria would yield six unanswered runs in the remainder of the game to drop the middle game 6-1. Sweets starting pitcher Ty Hueckman would pick up 8 strikeouts in six strong innings for the win. Finally, before a long bus ride home, the HarbourCats would try for the series victory in the rubber match. For the second time in as many days the ‘Cats would strike first with a Willow sac-fly, but couldn’t preserve the lead in the latter stages on the game to drop the series finale 9-7. A 7-run third inning proved to be the costly inning for Victoria, as Walla Walla clinched the series. Tanner Haney and Smith both hit a RBI double and single respectively late in the game to make the score a little favourable for the visitors. The WCL schedule makers fittingly pitted the only two Canadian teams in the league against one another for a three-game set over the Canada Day Weekend. Victoria took two of three from their Orchard City rivals back in early June, however besides one offensive explosion on Fireworks night, they wouldn’t find such luck in this series. Falcons shortstop Matt Voelzke proved to be a thorn in the side of the HarbourCats in the series, starting the set off with a grand slam and 5 RBI in the opener. Kelowna would double up the HarbourCats 8-4, on a extremely windy day at Wilson’s Group Stadium at Royal Athletic Park. A bright spot in the loss, Nicky Gibbs countered with a long ball of his own in the fifth for the HarbourCats. It may have been Fireworks Night with Eagle Wing tours, but Dustin Miller’s bat provided a firework display of his own for the ‘Cats in the series middle game. Behind four hits and 8 RBI from Miller, the HarbourCats exploded for a season high 22 hits and 18 runs in a 18-7 victory over Kelowna, ensuring there would be a rubber match in the Canada Day matinee. However, Victoria couldn’t muster up that same kind of offence on Canada Day, getting outhit 18 to 3 in a 6-3 loss. The HarbourCats once again jumped out to an early lead, but couldn’t preserve it heading into the final innings. Tied at 3 entering the eighth, Jake Fisher hit a RBI single to give the visiting Falcons their 14th win of the season and series victory. Jason Willow must enjoy playing baseball in Victoria. Making his season debut for his hometown team on Friday night, the Victoria native earned at least one hit in his first three starts. The 2017 Baltimore Orioles draft pick boasts a .333 batting average with four hits, a home run, and 2 RBI in three games so far. With Oregon State capturing the NCAA College World Series ending in dramatic fashion last week, the HarbourCats are expecting to see a few players join their roster for a second half push for the playoffs. In the meantime, Utility man AJ Lewis from the University of Missouri and Southpaw Ryan Rutherford of UC San Bernardino both joined the ‘Cats this past week. As the month of June comes to a close, it means the first-half pennant race is starting to heat up. Since the West Coast League is essentially broken down into two seasons, a first and second half, it means as the calendar approaches July teams will start to jockey for playoff positioning. The 54 game schedule is broken down into two 27 game halves, with the first half coming to an end on July 4, teams that sit in first place in the North and South division after the first 27 games clinch a playoff spot — called the First Half division pennant winners. Then the teams will reset their record at 0-0 for the second 27 games, and the two atop the division at the end of the second set of 27 games will own the Second Half division titles and spots in the WCL playoffs. The Bellingham Bells have been a force in the North all year, and with a win Saturday night over the Yakima Valley Pippins cliched their WCL leading 17th victory and North Division title. With three games left in the First Half, the HarbourCats will shift their attention to the Second Half of the season to try and claim a pennant title and playoff spot for the third consecutive season. After the 2-4 week, the HarbourCats will look to finish the First Half on a positive note in Bellingham. The Bells (17-6) come into the series fresh off a division crown and winners of four straight, as the ‘Cats will look to spoil their parade before returning home after the three game set from July 2-4. Once back on the Island the HarbourCats will welcome the Highline Bears, a summer-collegiate team from the Seattle area, to Wilson’s Group Stadium for a two-game non season affair. The tune-up against the Bears will be a perfect sharpening for new players joining the ‘Cats, before embarking on a crucial 27 game stretch over the back half of the season to try and clinch a postseason berth. Victoria will immediately return to WCL action after the Highline set, hitting the road to Corvallis for a weekend series July 7-9. It will be the first time that the HarbourCats and Knights have faced off since last seasons heartbreaking two games to one loss in the WCL finals, and it promises to be a great start to the second half of the season. That’s all for now! 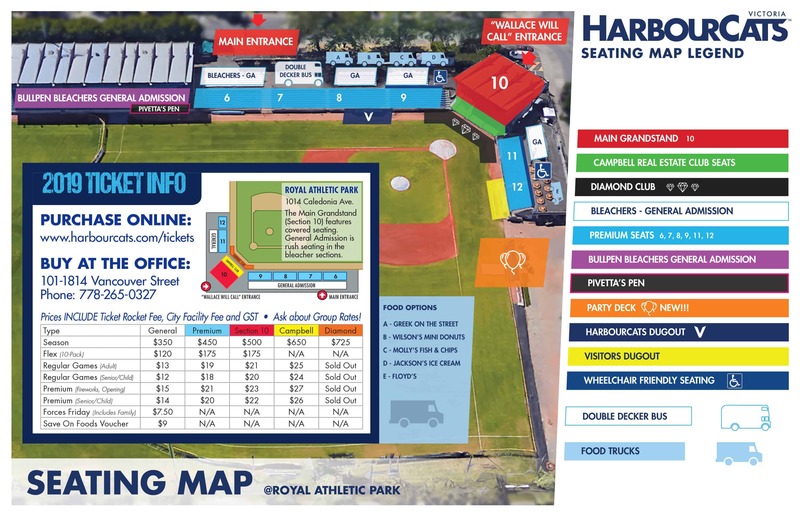 Enjoy your week Victoria, and come out to support your HarbourCats against Highline on July 5 and 6! For tickets visit our office located at 1814 Vancouver Street, call us at 778-265-0327, or purchase tickets online.